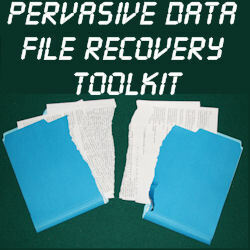 The ULTIMATE toolkit for Btrieve and Pervasive PSQL data file recovery! Includes the time-tested favorites of PATFIX (including the new Win32 version) and KeyCheck, but it also includes some tools never before available to the public, including GSRecover, PATCheck, LPLookup, and much more! These tools support recovering data from all versions from Btrieve 4.x through v9 database files, as well as uncompressed v9.5 files. These are the same tools that we use internally for our recovery services! Even better, this toolkit now comes with a complete manual on that describes the data file formats, discusses each tool in detail, and it even includes walk-through reports of real file recoveries! This is a veritable goldmine of information if you need to recover database files for your customers!